After debuting his second Decimal Repeater, Masterpiece No. 7, on the virtual pages of ThePuristS.com last week, one might expect its maker to enjoy a respite, a bit of quietude, before the madness of BaselWorld 2006 commences on March 30th. Such peace would certainly be well deserved, but there is no rest for the weary and no time for Kari Voutilainen. From his workshop in the small Swiss village of Motiers, Voutilainen is busy completing his latest watch, which happens to be another world first: an in-house chronograph, Caliber 25, with revolutionary oscillating system. "My first idea to make a chronograph came a long time ago, but the basic idea is to make a very solid mechanism and movement, without any delicate systems.... Something that you wind up and it goes and goes." Taking inspiration from his favorite vintage chronographs, Kari designed a double function system (start/stop button at 2 and reset button at 4), 30-minute counting, column wheel controlled chronograph mechanism that was arranged to suit the dial's layout. "I want to have clear vision - to see the time and to measure the time." The engine turned dial, signed "Voutilainen - Hand Made," has three sub-dials that are unusually located, but support his "clear vision" nicely. All indicators are separate and uncluttered from each other, including the hour and minute hand, which have been moved from the center of the dial to the 6 o'clock position, thus leaving the chronograph hand highly visible in its usual, central, position. The 30-minute counter is located at 3 o'clock and the large continuous seconds register is found at 11 o'clock. Voutilainen handcrafts the hands from gold and steel completing what might be the most legible chronograph available today. "Hand Made" isn't limited to Kari's hands when speaking of his watches. Gideon Levingston has made the 18kt. gold cases for Masterpiece No. 6, No.7 and now for Voutilainen's Cal. 25. Using a gold alloy concocted in his workshop, Levingston puts to use the centuries old techniques he has mastered to make cases to the standard and style Voutilainen requires. The cases measure 39 mm in diameter and 12.70 mm in height. In watchmaking, where working area is defined and quickly occupied, it is not easy to find a harmonious balance between form and function: Beauty not only in the mechanical execution, but also in its shape and proportion, its finish. Voutilainen has what seems to be an innate understanding of this, as he continues to satisfy watch aficionados with clever mechanics and artistic impression. He calls this "the beautiful theater" and it is played out most effectively when there is a tension, an exciting and contrasting counter point to the status quo. This we find most interestingly in Caliber 25: the classic watchmaking that inspires his work and the World Premier of the Carbontime Ltd. patented oscillating system. Carbontime, owned by Gideon Levingston (casemaker, watchmaker, artist, research physicist... jack of all trades, master of ALL - *an article featuring Levingston's work will be coming later this year) have developed a new balance spring material derived from graphitized Carbon and a Quartz balance, free sprung, with adjustment facility. This "balance complete" is in response to the thermal and magnetic deficiencies in modern oscillating systems. While I can't comment further on the Carbontime system at the moment (gives us a couple of weeks - more info and pics), I will say that after two years of practical testing a stability of rate that was once only mechanically obtainable with marine chronometers now seems achievable for the wrist. A series of 11, the manual wind chrongraphs will all be fitted with Carbontime's oscillating system vibrating at 21,600. 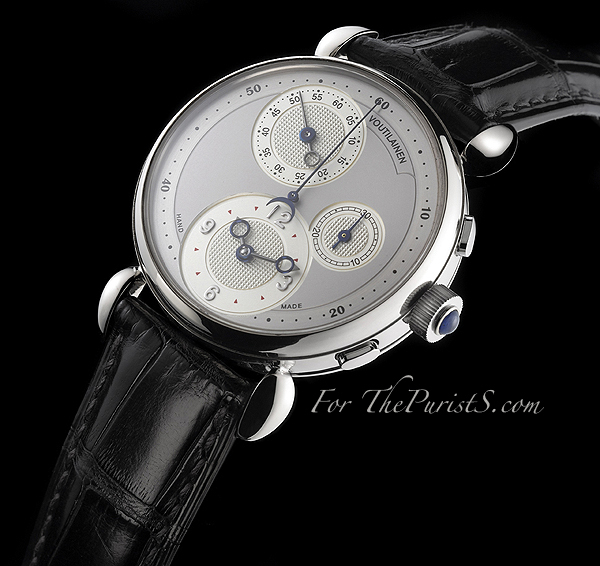 This dynamic duo, former teaching colleagues, friends, and colleagues once more, have brought to market what is not only an achievement of handcrafted know-how, but is also one of cutting edge technology that should make Voutilainen's Chronograph - Caliber 25 one of the most accurate mechanical watches ever produced. *The madness of Basel effects the industry and allied fields alike - photographs of the movement have been delayed, but will be available shortly and added to these pages. I will re-post the updated article at that time. Comments, suggestions, and corrections to this article are welcomed. Pictures provided by Kari Voutilainen unless otherwise noted.